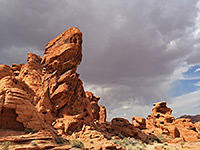 Nevada contains 12 state parks, seven state recreation areas, four state historic parks and one state historic site, concentrated in the south, around Las Vegas, and in the west, near Reno. Landscape-based preserves include rock formations, rivers, valleys, fossils, lakes and reservoirs, while historic places comprise charcoal ovens, forts, pioneer buildings and trading posts. Other Nevada listings: national parks. 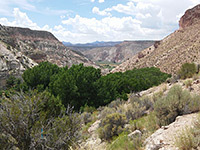 A remote area near the Utah border, centered on a deep, forested, steep-sided canyon (Headwaters Creek), plus the tributary of Pine Park Canyon. A dam was built here in 1961 but has since been removed because of flood damage. The park, which is very remote, reached only by a long gravel track, sees very few visitors and may be completely empty on some days. 18 miles from the nearest major highway, this isolated park contains Triassic fossil exposures and a mining ghost town, at the foot of the Shoshone Mountains. The sites are two miles apart; the town of Berlin sits at the edge of the hills, looking out over a typically wide, empty valley, while the ichthyosaurs are slightly higher in elevation, in partly wooded terrain along a shallow canyon. 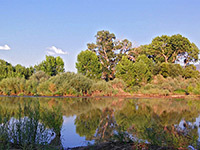 Two miles of sandy beaches along the Colorado River, downstream of Davis Dam; popular for recreation rather than scenery. 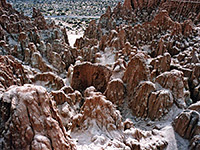 The park also includes a sizable area of arid washes and ridges, generally little-explored. This popular park features fantastic eroded rock formations including pinnacles, narrow ravines and short caves, formed by weathering of soft mudstone at the edges of a wide valley. Viewed by several short trails, along the edges of the valley and through one of the narrow drainages. The park also contains a campground and picnic area. Located near Panaca, along US 93. Boating, fishing and swimming in a 32 acre reservoir, surrounded by partly wooded hills; formed after the construction of Cave Creek Dam in 1932. In a remote area towards the east edge of the state, 15 miles from Ely. Short section of the wooded valley of the Carson River, south of Reno, and relics from an 1860s silver processing operation (Rock Point Stamp Mill); a small preserve, separated into two halves by US 50. Also contains picnic areas, short paths and a ten-site campground. 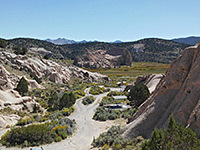 Remote reservoir surrounded by weathered rock formations, near Pioche. The schoolhouse is a single-room building in use between 1922 and 1967, containing many of its original furnishings. The exterior may be viewed at any time, but the interior can only be seen by appointment, on tours that are typically staged once or twice each month. 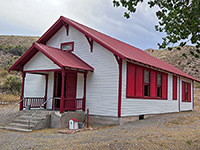 The schoolhouse is managed as part of Kershaw-Ryan State Park, and is situated along a quiet, isolated valley (Rainbow Canyon), 20 miles south of Caliente. Preserved station along the pony express mail route, and the remains of a 1860s US army fort, plus a section of the Carson River. 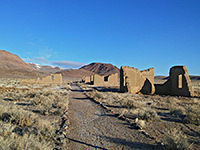 The station is intact, and contains many historic artifacts, though the fort itself is rather less complete as many of the structures are totally gone; significant ruins of 15 remain, stabilized following acquisition of the site by the state, in the early 1930s. Small area of desert washes and plains on the north edge of Las Vegas, rich in mammal fossils; adjoins the much larger Tule Springs Fossil Beds National Monument. 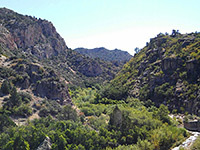 Short, spring-fed canyon south of Caliente, a tributary of the much larger Rainbow Canyon; cultivated in the 1870s as part of a ranch. The park has gardens, a campground, a half mile overlook trail, and a few stone structures built by the Civilian Conservation Corps in the 1930s. A large reservoir along the Carson River, west of Fallon; when full the shoreline stretches for nearly 70 miles. Offers boating, fishing, hiking and primitive camping. 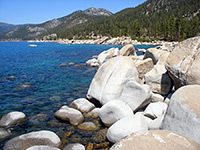 Sandy or rocky beaches on the east shore of Lake Tahoe, plus hiking trails and backcountry lakes, these nestled within the adjacent forested hills. Comprises four, separately designated units (Cave Rock, Sand Harbor, Spooner Lake & Backcountry, and Van Sickle). The park also contains several flumes from the 19th century, constructed to supply water for the logging industry. 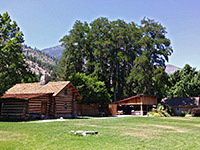 Replica of an 1850s trading post in Genoa, the original having burned down in 1910, at the foot of the Carson Range in the far west of the state. 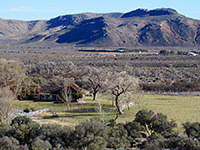 The settlement served cross-country travelers along the California Trail (the Carson Route), which entered the mountains a shortest distance south, at Woodford Station. 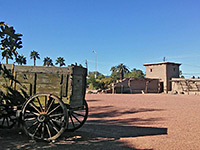 Mostly reconstructed remains of the earliest non-native settlement in Las Vegas, established beside a spring-fed creek in 1855; contains adobe buildings, wooden fences and historic artifacts. The site now has a busy, urban location, just north of the modern city center. Lengthy reservoir along the Humboldt River, surrounded by empty, high desert lands. A good place for primitive camping, with solitude and long-distance views. A fee is charged if entered from the south (I-80 exit 129), but an unpaved road around the north side (exit 145) affords free access and has several good places to spend the night. 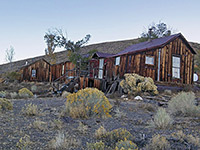 Collection of 19th and 20th century ranch buildings at the foot of the Spring Mountains just west of Las Vegas, adjoining Red Rock Canyon NCA. The park also contains a reservoir, a stream, woodland and several green fields, and is a popular location for hiking and picnicking. 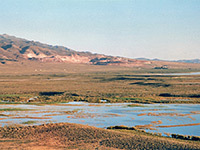 Reservoir amidst grassland, low hills and marshy meadows, along the Humboldt River (South Fork), 15 miles south of Elko. Flat-floored valley, low hills, historic buildings and a reservoir, in a remote location east of Pioche near the border with Utah. The scenery includes outcrops of light-colored volcanic tuff, eroded into little fins and gullies, so the landscape is quite photogenic and the place has more to offer than is often the case for parks where the sole attraction is a lake or reservoir. The best and most visited state park in Nevada: spectacular, weathered landscape of red, yellow and pink Aztec sandstone, in the Mojave Desert close to Lake Mead. The park also has petrified dunes, narrow canyons, sheer cliffs and petroglyphs, and may be explored via short paths or off-trail hiking. Former ranchland along the East Walker River, including 28 miles of the waterway; 12,000 acres in total, divided between four separate units. Established late 2017. 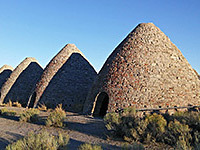 Six well-preserved charcoal kilns dating from 1876, in the foothills of the Egan Range south of Ely; set in a typically remote Great Basin landscape of gently-sloping, sagebrush-covered hillsides and small summits. Besides viewing the ovens, other activities are camping, fishing, cycling, ATV use, and skiing and snowshoeing in winter. Scenic, natural lake near Carson City in the Sierra Nevada foothills. The most remote state park in Nevada; short section of the shoreline of a large reservoir along the Owyhee River, close to the Oregon stateline.